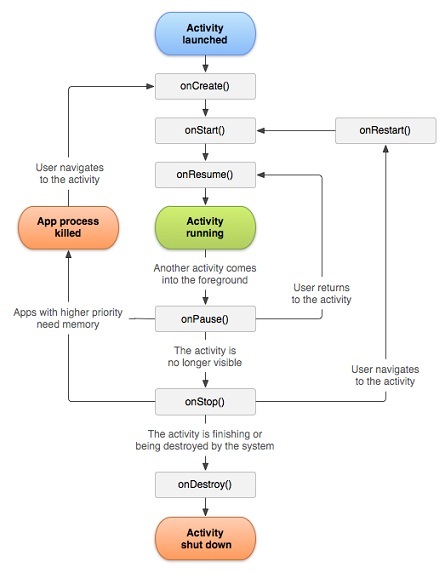 This section describes the android.app.Activity class which represents an activity you allow the user to interact with on the screen. An activity has 4 states: Active, Paused, Stopped and Destroyed. In the last chapter, we learned how to access the Android application environment information using the java.lang.System and android.os.Environment classes. Now let's take a closer look at the starting class of our simple applications created so far: android.app.Activity. The android.app.Activity class represents an activity you allow the user to interact with on the screen. The android.app.Activity class takes care of creating an empty window for you to place visual content using the setContentView() method. Active - If an activity in the foreground of the screen (at the top of the stack), it is active or running. Paused - If an activity has lost focus but is still visible (that is, a new non-full-sized or transparent activity has focus on top of your activity), it is paused. A paused activity is completely alive (it maintains all state and member information and remains attached to the window manager), but can be killed by the system in extreme low memory situations. Stopped - If an activity is completely obscured by another activity, it is stopped. It still retains all state and member information, however, it is no longer visible to the user so its window is hidden and it will often be killed by the system when memory is needed elsewhere. Destroyed - If an activity is paused or stopped, the system can drop the activity from memory by either asking it to finish, or simply killing its process. When it is displayed again to the user, it must be completely restarted and restored to its previous state. Entire lifetime - The period between the moment the activity is created and the moment the activity is destroyed. Visible lifetime - The period between the moment the activity is started showing on the screen and the moment the activity is stopped showing on the screen. Foreground lifetime - The period between the moment the user resumes interaction with this activity and the moment the user switches to other activities leaving this activity paused. See next tutorials on you can add code logics when the activity entering or leaving a lifetime period.